Chrome developers have added a useful feature to protect thier Google Chrome users from malicious extensions and apps. Some of the extensions and apps hijack Google Chrome settings to serve ads and things like that. This is a major problem and affecting lot oof users according to Google and is growing at a faster rate. We have also heard recently that some adware vendors are buying successful chrome extensions to include their ads. Google is taking another step to protect their Chrome users. 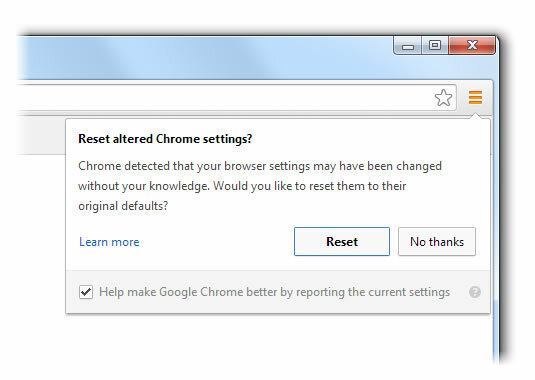 If an extension changed any of the Google Chrome settings Chrome will now show a warning to users, allowing them to reset the browser settings to previous state. Users can also skip the warning and continue to use if they don’t find anything alarming. Chrome developers have added a reset browser settings button in last October, using that you can reset the browser to factory settings. The latest warning feature is more attentive and lets everyone to check what is changed. So if an updated extension changes the settings you will be able to know. Remember clicking the reset button will disable all the extensions, themes and apps. You can re-enable the extensions later after examining them. Apps are enabled when you use them next time. If you are in-doubt you can always go to the Chrome help forum.